You are here: Home / Eh Brah / Eh Prius Hater! Eh, you driving the big red 4×4. You can’t miss your truck, especially considering the smoke stack exhaust pipes sticking up in the truck bed and the arrow stickers on the cab window pointing to them. 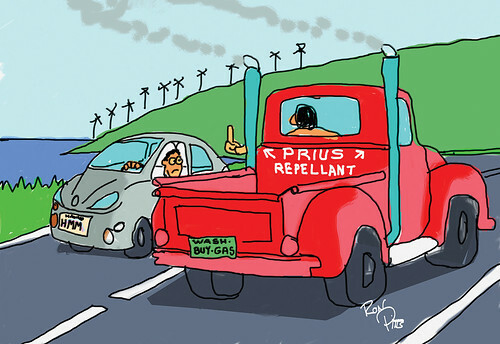 Oh, and the truck is also emblazoned with the words “Prius repellent.” I noticed your Washington license plate–just where do you think you moved to? We care too much about our ‘aina to think you’re funny.